Since its foundation in 2010, Hello Wood has been concentrating on inspiring and teaching the new generation of architects to turn their attention to the topics that are disregarded by most of the architectural education today. Hello Wood is an independent, international educational platform in design and architecture. It teaches to think with our hands and learn through experience. Encouraging a more practical approach, they emphasise the importance of craft, thinking through making, and examine the act and experience of establishing a new community to express their importance for architects. Hello Wood functions as a creative architectural and design studio in the same time. Their typically temporal and mobile installations appear at major European festivals and events. The studio can be seen as a sibling to the summer school since all of their works are centered on social responsibility, designing for a life cycle and the relation between community and architecture. The studio is a site of innovation, product development, and the designing of large-scale installations. The main goal of Hello Wood is to give a new direction to the architectural education highlighting the importance of practice and learning-by-doing aspects. On summer festivals they work together with the youngest generation of architecture scene and get a deep impression of the way they are thinking. 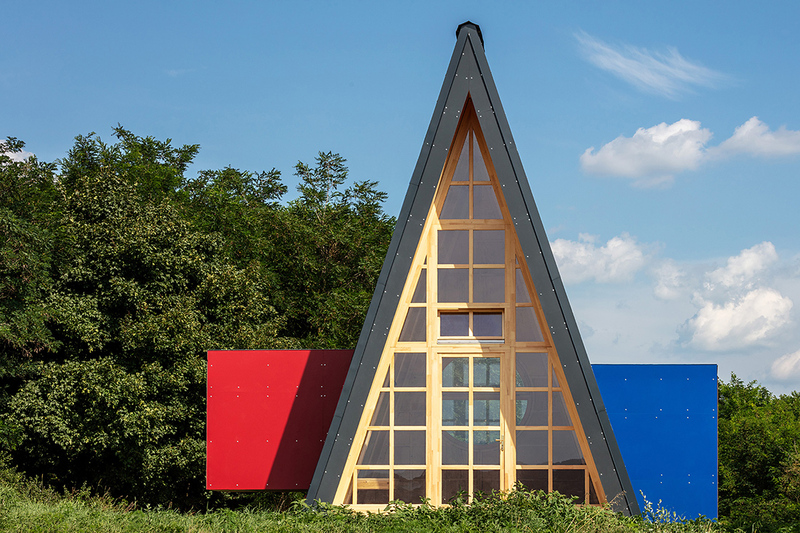 In 2018 their international summer school focused on building cabins of wood – seven tiny houses were built during the nine-days-workshops where the students got an insight of creative design, new technologies, materials and tools. Gaining new experiences and knowledge in this process Hello Wood Studio continued developing new tiny home design and structure to the market. Hello Wood has a lot of experiences of popular and innovative projects collected during educational experimentation and product development. UP PARK is a spectacle public space for locals and tourists in the heart of Budapest. It was initiated to breathe new life into an unused place in the city centre. The intention of TEXTÚRA RESTAURANT’S interior designers (Muzsai-Ficzere) was to create a complex design program for the restaurant based on organic shapes and structures. Hello Wood was responsible for the structure design and construction where they used parametric design, 500 different types of joints and 5-axis CNC-milling.